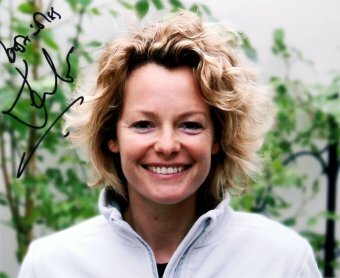 Katherine ('Kate') Humble was born in Wimbledon in 1968. She grew up in Bray, Berkshire where she lived next door to a farm and spent most of her spare time mucking out the horses. After she left the Abbey School in Reading, After leaving school she travelled to Africa and spent a year doing various jobs like hatching crocodiles, driving and cooking for safari companies, making her way slowly from South Africa to Egypt. She arrived in Cairo with just £5! subject of her first article for the Daily Telegraph travel section. 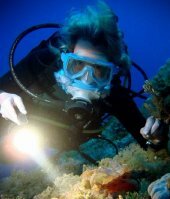 Since then she has written articles ranging from diving and cycling in Cuba, to hippopotamus conservation work in Ghana. and personality, she began as a reporter on programmes, ranging from Countryfile, and Rolf's Amazing Animals. In 1999, Kate presented 31 episodes of Top Gear, the BBC's the long running show about cars, and also a stint presenting City Hospital where she broadcast live from from Guy's and St Thomas' Hospitals in central London. environment around them. The series ran to thirty six episodes over five years. depths of the ocean in The Abyss, with a repeat the following year. Bill Oddie and Simon King to present Wild In Your Garden, a week of live broadcasts which followed the lives of the animal residents of two Bristol gardens. has run each year since 2005. They also presented an autumn edition Autumnwatch from 2006-2008. The team have also written a Springwatch & Autumnwatch book to go with the series. Kate says of Oddie, "Bill ranges from being unpredictable to downright difficult, but he's passionate about his subject. Sometimes I could cheerfully throttle him, but the bottom line is I'm terribly fond of the old sod!" 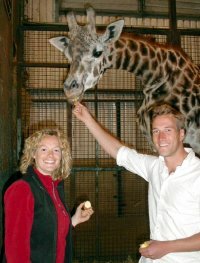 Kate Humble was joined by Steve Backshall for Ultimate Caving (2007). In this she tackled four different and treacherous caves in the UK, pushing herself to the limit as each cave became more difficult. The final cave, Titan at Castleton in Derbyshire, included a vertical ascent of 141 metres on ropes - higher than the London Eye! Kate's other grandfather, Stan Carter, was an airman during WW II. He was shot down on a bombing raid, and eventually sent to Stalag Luft III in Poland, the scene of the Great Escape. Kate and Ludo are both very enthusiastic, qualified SCUBA divers. This is not Kate's usual image! 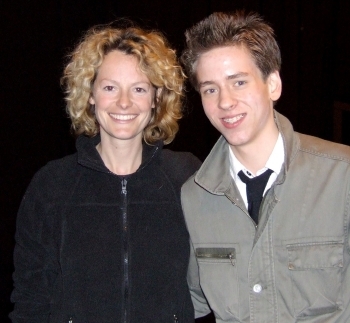 Kate has two sons, Bertie (b.1994) & Lawrence (b. 1996). 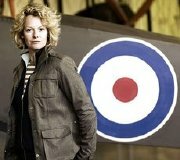 Kate Humble in Who Do You Think You Are? Kate in Who Do You Think You Are? 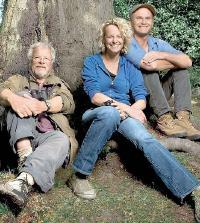 Kate Humble - "Why I want to kill Bill Oddie!" 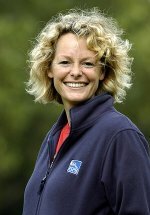 I met Kate Humble at 'The Outdoors Show' which was held at the NEC in March 2008. She gave a talk about making Ultimate Caving and showed video clips from the programme, including her scaling the 141 metre high Titan cave in Derbyshire, on a rope! Kate signed a photo for me, and also my book about her TV series Springwatch.